The name "elk" is a bit confusing because in Europe, moose are called "elk." Also in Europe, the red deer is considered the same species as North America's elk, which doesn't help matters. Many biologists believe the name "wapiti" (WAA-pi-tea) is a Shawnee Indian word meaning "white rump," an appropriate description for the elk's large rump patch. Cervus is from the Latin word meaning stag or deer. The elk is the second largest cervid in North America; the moose is the largest. Elks’ body lengths range from six and three quarters to nine and three quarters feet, while they stand four and one-half to five feet tall. Adult males weigh six hundred to one thousand pounds or more, and females weigh between four hundred and fifty to six hundred pounds. The males have antlers that can span five feet and ordinarily have six sharp points or "tines." Elk (and the other members of the family) have an even numbers of toes (two) on each foot, a characteristic that separates them from other hoofed mammals. Adult males and females are tannish brown above and darker below, with long legs and short tails (up to eight inches long). In late spring they molt or shed their tan winter coats for reddish brown coats. The small whitish tail is surrounded by a yellowish white rump patch that is bordered by darker hairs. Bulls have a dark shaggy mane that covers their necks. The elk’s antlers grow in spring, when they are covered in "velvet," or short fur, containing blood vessels which nourish the growing bone and nerves. When the antlers have completed the growth, the velvet is shed. After the mating season, the antlers themselves are shed. Mammals with these types of antlers are called "cervids." At one time, elk ranged over most of southern Canada and the United States, even the plains states. Overhunting caused a drastic decline in their populations, and by 1900, they had disappeared from ninety percent of their range. Today, elk are found mostly in the Intermountain West states of Montana, Idaho, Wyoming, Utah and Colorado as well as along the Pacific edge states, Canada, and a few other states like Kentucky and Minnesota. In February 1913, 83 elk were released in Cabin Draw near Chevelon Creek. From these transplants the Arizona elk population has grown to nearly 35,000 animals. Reintroduction programs are underway to reestablish elk in their native ranges. Elk are montane creatures, preferring semi-open forests, mountain meadows, foothills and valleys. They can range for quite a distance in search of food or to colonize new locations. 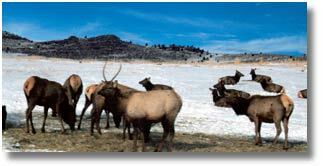 In the winter, elk travel to lower elevations with less snowfall to cover forage. In the summer, they return to the higher elevations and cooler weather. This is called "altitudinal migration." Elk may be seen throughout the day, but they are most active at night or during dawn and dusk. They lay low during the hottest part of the day, seeking shade and cool locations. Elk are herbivores, meaning they feed on plant material. 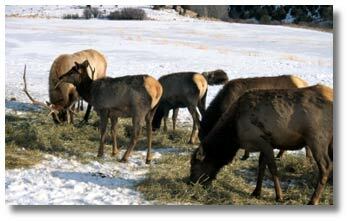 Elk eat new growth on shrubs, woody vegetation, grasses and other herbaceous plants. Elk chew their cud, meaning food is regurgitated and chewed over and over until it is broken down enough to be passed through the intestinal track. In late summer, male elk (called "bulls") "bugle," a true wilderness sound that starts as a bellow, changes to a loud whistle, and ends in a series of grunts. The bugle serves to challenge other bulls and to attract female elk (called "cows"). From August through November, bulls join herds of cows and calves from which they have been separated during the summer. During this time, the males engage in rutting behavior in which the males joust for dominance, bugle, wallow in the mud or water, and urinate on plants that they then toss onto their antlers. Biologists think that this activity makes the bulls more fearsome to other bulls and more attractive to potential mates. What the cows must think! One bull may have a harem of fifteen to thirty cows, but some may have up to sixty. Cows breed at three years, bulls at four. Pregnancy lasts eight and one half months. Twins occur rarely. Calves are spotted on the top and sides, but not as much as a newborn deer. They weigh about thirty five pounds at birth. The elk calves can walk within minutes after birth, an escape response to potential predators. Calves are weaned after about nine months; but they begin to eat grass after only a month. 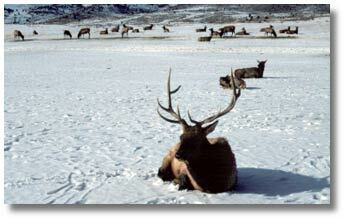 Elk die from hunting, predation, starvation, disease and harsh winters. Mountain lions are their main predators, but wolves and grizzly bears can also prey upon the elk. Harsh winters, with deep snows and inaccessible forage, can significantly reduce a herd size. Elk are great runners. They have long limbs and efficient locomotion due to the "double-pulley" arrangement of the limb bones called the "astragalus." The arrangement allows for a forward-backward motion of the attached bones, thus keeping the limb movement to one plane.